After completing a scientific expedition in the rainforests of southern Mexico, you returned home only to discover that you had done more harm than good. Now, you must return to some of the darkest corners of the Earth to undo your mistake. 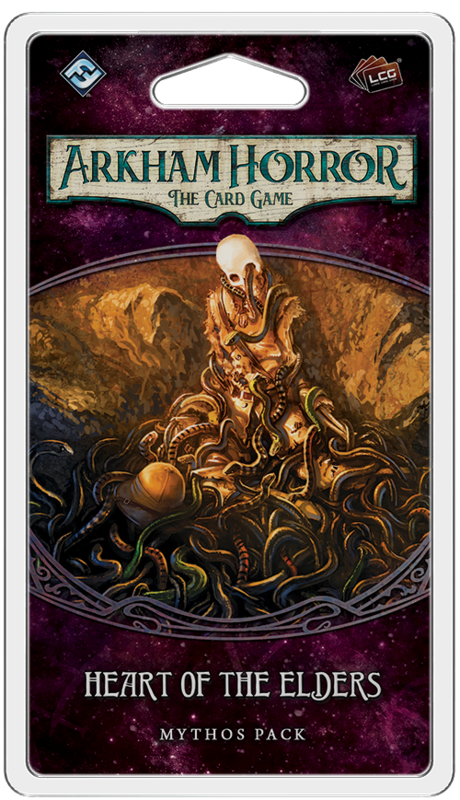 Fantasy Flight Games is pleased to announce the upcoming release of Heart of the Elders, the third Mythos pack in The Forgotten Age cycle for Arkham Horror: The Card Game! Heart of the Elders contains Scenarios V-A and V-B of The Forgotten Agecampaign. The pack contains sixty cards, including new players card to enhance your investigator decks and new scenarios which can be played in Standalone Mode or as part of the larger The Forgotten Age campaign. Following the events of The Boundary Beyond, you leave the safety of civilization behind and journey deep into the rainforest. Surrounded by uncharted wilderness, you can feel the glare of countless eyes watching you from beneath the shadows of the trees. It’s almost as if the forest itself does not want you to reach your destination. After days of struggle, you uncover the entrance of an enormous cave, but something is not quite right. Six large pillars stand near the mouth of the cavern, covered in strange carvings that you cannot understand, but something scratching at the edge of your consciousness tells you that you’ve seen them before. Maybe they are some form of language, or a lock system? If you make one mistake now, it could leave you buried alive in the cave, but how much time can you afford to spend investigating the pillars as your provisions run low? Starvation will kill you just as surely as a cave-in. You must make your decision quickly, for the threats of the jungle continue to encroach upon your expedition camp. The strange Flora of this region are among the deadliest in the world. 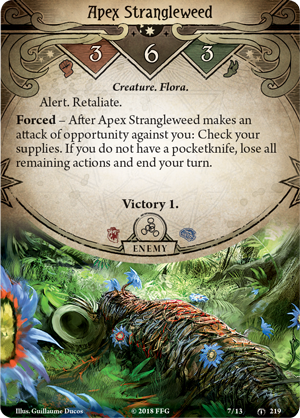 Apex Strangleweed (Heart of the Elders, 219) will choke the life from you if you cannot cut yourself free, and even the most innocuous plant can prove lethal. 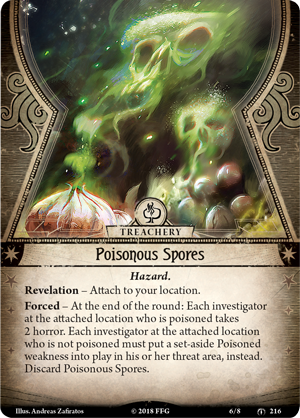 Any investigator who finds themselves trapped in a location covered with Poisonous Spores (Heart of the Elders, 216) becomes Poisoned (The Forgotten Age, 102); and any who already bear this permanent weakness begin to hallucinate, suffering two horror. Should you survive the treacheries of the jungle itself, even more dangers await you underground. 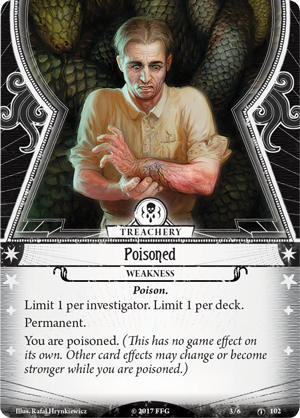 Heart of the Eldersis the first Mythos Pack in Arkham Horror: The Card Game to feature a two-part scenario, bringing your investigation from the jungle to the cavern. You will have to overcome both the horrors of the jungle in Scenario V-A as well as the terrors of the cavern beneath in Scenario V-B. What awaits you beneath the shell of the Earth, where sunlight has not touched for years? The investigation is yours, and the only way to find out is to continue onward. In addition to the next chapters of The Forgotten Age cycle, Heart of the Elders provides you with an assortment of new player cards to help move your expedition forward. If you wish to survive your extended stay far from civilization, you will need to fill your ranks with skilled allies and experts in their fields. 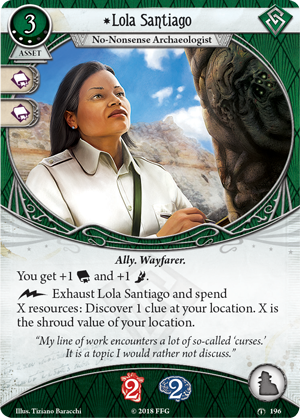 If you are playing as a Rogue, you can hire archaeologist Lola Santiago (Heart of the Elders, 196) to help you dig up clues. In addition to increasing both your intellect and your agility, you may spend resources to discover a clue at your location. 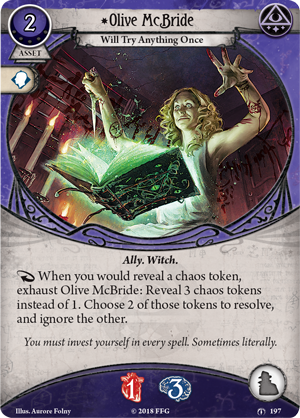 Meanwhile, Mystics may bring Olive McBride(Heart of the Elders, 197) into the fold of the investigation, using her skills to manipulate the chaos bag. 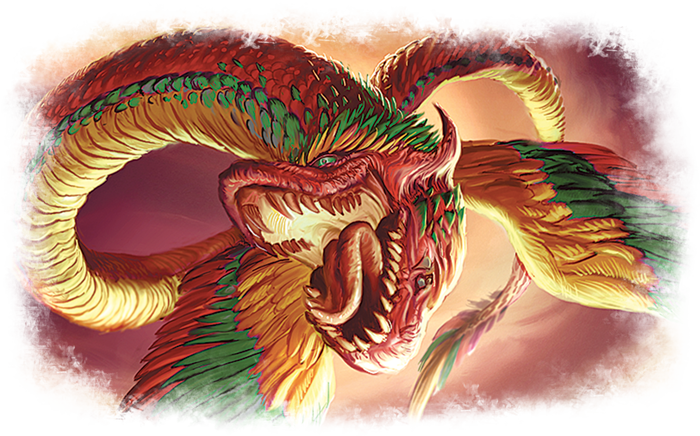 If you exhaust this Witch when you would reveal a chaos token, you can instead reveal three chaos tokens and select two of them to resolve. It might backfire horribly, but without risk, there can be no reward. Allies can give you the edge as you journey into the jungle, but when you don't know who to trust, the only person you can rely on is yourself. With enough spirit and will to survive, you just might complete this mission Against All Odds (Heart of the Elders, 202). Whenever you're performing a skill test with a difficulty higher than your base skill, you can play this event to reveal additional chaos tokens and choose one of them to resolve. Of course, this event is useful whenever you feel overmatched, but it can be downright essential for the game's newest investigator, Calvin Wright (The Forgotten Age, 5). 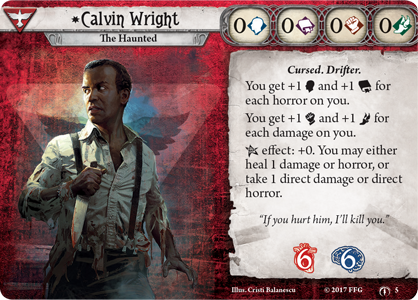 While his willpower and lore increase for each horror on him, and his combat and agility increase for each damage, the base value of each of Calvin’s skills is zero. For example, let’s say that Calvin has suffered two damage during a scenario when he finds himself locked in a fight with an Apex Strangleweed. Calvin’s combat value is two, one less than the deadly Flora. However, since the base combat value printed on Calvin’s investigator card is zero, when he plays Against All Odds, he draws a total of three tokens from the chaos bag, greatly increasing his chances of victory before he even commits any cards! 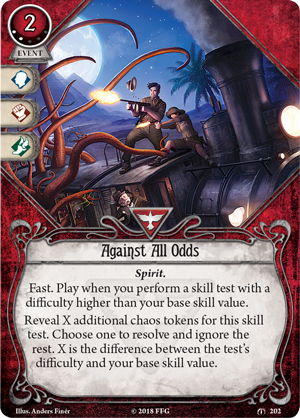 When a single test could mean the difference between life and death, this card may be the answer to your prayers.